In 1896, the U.S. Supreme Court case of Plessy v. Ferguson ultimately defined the meaning of segregation into specifying it as a racial divide in which both groups are "separate but equal". It stemmed from an 1892 incident in which African-American train passenger Homer Plessy refused to sit in a designated black railroad car, breaking a Louisiana law. Rejecting Plessy’s argument that his constitutional rights were violated, the Court ruled that a state law that “implies merely a legal distinction” between whites and blacks did not conflict with the 13th and 14th Amendment. 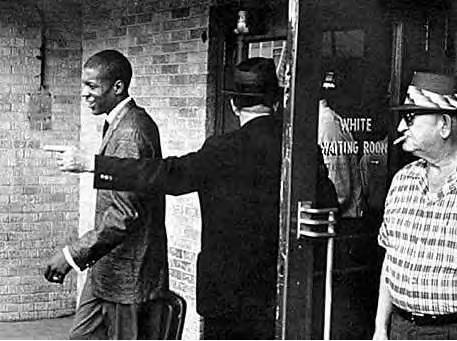 The ruling of the case supported state's rights in matters of enforcing racial segregation. In result the states were granted the right to make racial segregation mandatory in most aspects of white and African American life. The Federal governments acceptance reflected weariness on the part of northerners dealing with social issues in the South. Go to "1901 Constitutional Convention"